Will any of those artists be at the dubclub that week? THere will be an afterparty at Dub Club the night of the festival and some of the artists may be there. But not on the wednesday. what time does it start and how late will it go? how will the parking be? It's from 2pm to 11pm , there will be parking at the site , all the parking and other info will be up at dubquake.com soon. Original Roots Radics members Style Scott (drums), Flabba Holt (bass), and Dwight Pinkney (guitar), will be joined by several guest players (replacing Roots Radics members who are no longer with us). On vocals will be Jamaican veteran Lloyd Hemmings, as well as 70s rub-a-dub icon Ranking Joe who will add his classic toasting style to the dubs. Bionic DJ Rankin Joe Booom! havent seen PB wolf inna couple years! I would love it if somehow someone could record that Radics and Scientist session....help us East Coast brothers out. Peanut Butter Wolf... of Stone's Throw Records... whoa. Dubquake is changing locations. 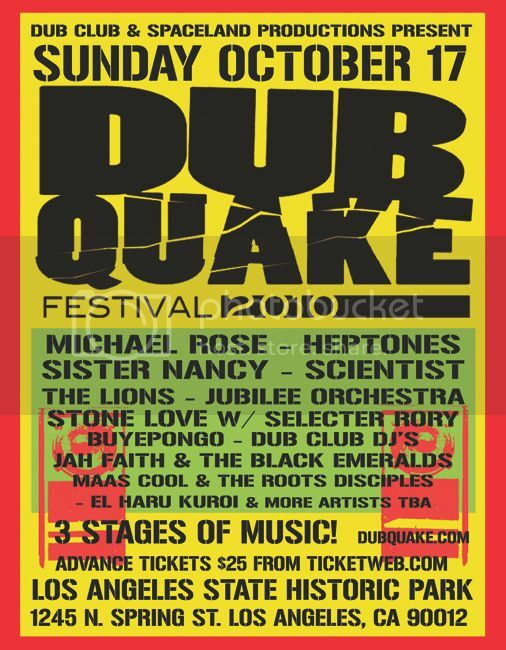 Instead of Sunday Oct 17 at LA Historic Park, the festival will now be Sat Oct 16 and Sun Oct 17 at The Echoplex/Echo , home of the Dub Club, 1154 Glendale blvd in Echo Park , LA. We will be open from 6pm - 2am each day , and we will have food trucks and vendors in our parking area. advance tickets are still $25 , which will get you in both nights . day of show tickets are $20 each night. What a treat! Can't believe the excellent prices too! How do you have a festival indoors in a small, non- smoker friendly venue? When there's a " Quake" its best to be outdoors! I'm highly disappointed. Couldn't agree more toka. Still gonna be a great line-up, but going from a festival outdoors in a beautiful daytime park setting, into a restricted dark nightclub leaving at 2 A.M?!. Sucky. And I assume this will now be 21+?!!? So no family?! my son is less than thrilled to miss sister Nancy, we have been planning this for a while. Will there be food and merch vendors still?! I'll still be there at least 1 night but am majorly disappointed as well. Cest la vie! Don't get me wrong I love my dub club as well, but I had planned on my kids and I sitting on a blanket in the Fall sunshine with 3 stages to drift about to with huge Marley flags in hand, lots of pleasant sights and smells in the fresh air, kickin our shoes off walking on the grass through the trees and enjoying a cool drink and a warm smoke, being able to see all those great artists in one day and still be home at a decent hour. Now with "that" lineup, it will be myself alone, in a non herb friendly bar packed like a trendy sardine can, waiting an hour for the bartender to finally bring me my $8 coors light. Good music and good friends is now the only reason for my journey. Thanks Joey. Luckily I assumed wrong AGAIN!! And for the smoking at least we can go in and out as we please! also: Sister nancy both nights... is that correct?!? Is General Jah Mikey the 80's deejay (I think from Socialist Roots)? Or somebody else? Yeah General Jah Mikey is indeed a veteran 80s DJ. That's gonna be reeeeeal nice. Counting days turns to counting hours - about 70 to go........ Thanks in advance Tom for all the hard work you've put into making this happen. Scientist/Radics/Ranking Joe live - massive and historic!!!!!!!!! When is this? Where is the Echo Club, si? There's a very good chance I'll step to this... If'n my grandchildren will let me go... and my Geritol don't run out. We've already met. I'll make a point to say hi and buy you your choice of libation. Nice to have you back JB. Edited 1 time(s). Last edit at 10/15/2010 07:51AM by trendski. Here's the schedule of performers.Early arrival is a good idea, there are solid acts right from the start. Sabar All Stars in particular are really good. 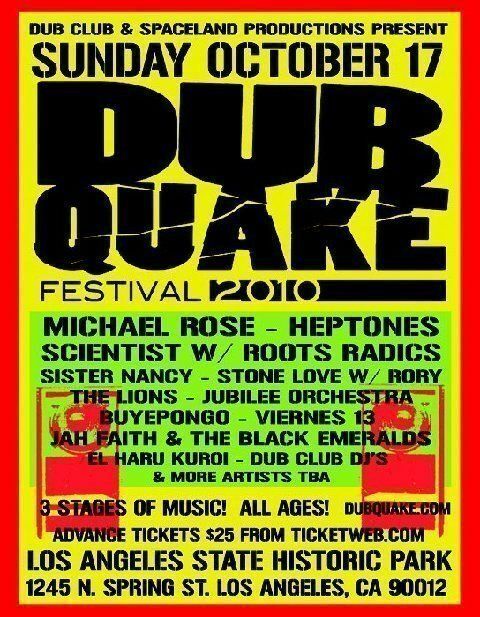 I dont go to reggae shows often but I got to see the Radics and Scientist with special guests General Jah Mikey, Ranking Joe and Sister Nancy last night, I just got home from the show! UN FREAKING BELIEVABLE!!!!! RUB-A-DUB sound inna 81 stylee LIVES! The Roots Radics cannot be topped LIVE, they are the best to my ears and it seemed like alot of folks felt it too. Those of us fortunate enough to be there got to take a ride in a timemachine. The Radics/DJ set with Scientist was the High point of the show. The show had some challenges, but the really good parts were EPIC!!!!! Uh lets see Ranking Joe performing Weakheart Fadeaway hello!!! Ranking joe stole the show in my opinion in the DJ set. General Jah Mikey was also off the hook, Sister Nancy rounded out the set really nicely. "BAM BAM" more on this in a minute. This is really about the Roots Radics re-union. its what made this an extra special night. The opening performance of the 'Vampire' album was pretty interesting. It felt like folks almost didnt know how to react to live Dub this way, it was good I just really missed the vocalists with their vocal snippets "you are a no good you are a no goo o ad, for the things you do in front of meeaaaa...", I thought that that was the plan for the performance but the dubset was without vocals. They had the samples "I want Blood ha ha ha!!" and some others which were a nice surprise. It was overall pretty dam faithfully played and SO much better than I ever imagined. Flabba Style and Company had EPIC moments in the dub, and had a Sax player that really set off Firehouse Rock. I think Dwights playing on this track was really extra nice, people kept cheering when those guys would play their phrase and Scientist echo chambered it out. I was so happy to see the horn player up there, its rare you get to see them these days. That brass just cuts through you know. Scientist did a really good job I think there were some really cool parts he did flying his faders and it was cool to see the band interacting with it. The Radics were getting more experimentational (sp? is that a word) toward the last half of 'Vampire' as they tried to stretch out the dub and push it a little further, Flabba and Style did not miss a beat...I dont think thats in their DNA. Did I mention the percussionist? his little scratches and cow bells added that little extra special touch. some of the tracks on 'vampire' worked much better than others live and there were also some pretty serious sound issues, but not enough to kill the momentum and heat coming offa that drum and bass combo of Flabba & Style. They never broke form. Let me say this slow so you all can hear me.......no one, I mean no one can touch these two when they are locked in the groove, groove isnt even a strong enough word. Sorry thats just what I think after seeing it. It was as good as on the records from the early 80s, they transported me back to the heyday of Channel One studios. I used to play some of these rhythms with a reggae band 10 years ago. It was such a treat to see them play those same rhythms in the way only they can. Live no less and in the year 2010!! something like this for over 16 years! After hearing them play all the tracks in sequence, I was really ready for the DJ set, there was a Japanese DJ before Jah Mikey came on but I didnt catch her name and missed most of her performance and got back just before General Jah Mikey, never heard of him but great energy on stage and his Dennis Brown, Milk and Honey song check in his rhyme really got me. Great Singjay style. I think I died when Ranking Joe was introduced, I forget what song they went into but I will never forget how I felt when he launched into his thing. I was absolutely blissed out the whole time he was up there. Love Ranking Joe what a class act he is. Sister Nancy came out and did her songs and seemed to really enjoy herself. She had really good energy. It was very cool to have her to balance out the Men performers. Her voice was a little rough but It didnt matter. I feel so blessed I got to see it in my lifetime. It has been my dream to see the Roots Radics do something even remotely this cool. I will never forget it. It was an historic event. Oh almost forgot, Big shout out to Tom for putting this together and the whole Dub Club crew. These guys really know whats up, I gotta go to more shows here and support them for keeping it real and heavy. AND BTW GUYS IN THE SO CALIFORNIA AREA. just got home... my ears are still ringin... got lots of vids from both days comin! Was also curious how Peanut Butter Wolf's set went down also? Edited 2 time(s). Last edit at 10/20/2010 01:17AM by sideways. Vids of the Radics/Scientist dub set please!! Edited 1 time(s). Last edit at 10/19/2010 05:05AM by FLEXIMIX. had it not been for man like TOM CHASTEEN!...BIG UP! Edited 2 time(s). Last edit at 10/20/2010 11:46AM by sideways. Extra Special Thanks to Tom and everyone else (except the engineer from sunday) at the Dub Club for putting on an incredible event... too many highlights to mention! The majority of the artists did an amazing job both on stage and in studio... so many musical blessings! Sideways & Scientist: we owe extra gratitude to you for treating us like family... FullWatts Loves You! Dubiterian brought the only melodica to the event. That was much appreciated. Buyepongo - Obviously not reggae, but they had a real cool sound - 4 percussionists, bass, soprano/clarinet and alto/bass clarinet/clarinet. Cumbia beats in a modern, yet classic style. That was a nice change of pace sunday evening. @Papa Ray - Radics were great! It was cool to see them in a dub format. More space to do what they do best - set up a huge pocket and fill it. This was my top pick for the weekend, don't miss the Rockit Room show if you can help it. As always, Rankin' Joe was unstoppable. He sounds as good or better than he ever did and keeps things fresh/relevant. His rap about bed bug hysteria was especially sharp. Nice to see The Heptones play a much longer set than at SNWMF. Country Boy! There just aren't singers around like Leroy Sibbles. About as close to Otis Redding as you're going to get. Emotional, convincing and perfectly sculpted power. @ericv - PBW was cool, different. Tracks from a variety of currently available sources. Started with Earl Zero playing acoustic guitar in Word, Sound and Power. 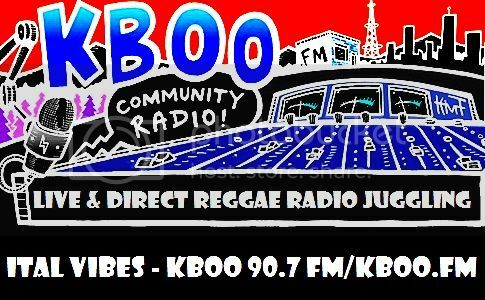 Some clips from Rockers, Deep Roots Music, a Supercat video, etc. The focus was on mixes/blends and beat matching. Jubilee Orchestra sounded good. I'm pretty sure it was them that played a good take of Tosh's Mystic Man. The videos will tell at least half the story...... $25 was a steal for all the great live music - Thanks Tom. @ Tahoe - Good to meet you for a minute! Hope to talk to you another time when it's not so loud. I remember back in the 80's when Binghi Bunny was still around and they would always open up their shows with a searing version of Rockfort Rock. Those Scientist Dub Albums were essential Walkman listening way back in my High School days. Big Respect & Honour, Foundation Reggae. I saw numerous Israel Vibration live shows in the mid to late 90's In D.C. all backed by the Radics and they always opened with Rockfort Rock. There is a nice version of it on their Israel Vibration Live Again album. I was very young and one of these was my first ever reggae show and I just remember being in awe of Flabba....he was amazing. I remember turning to one of my friends and saying "I don't think the bass player has opened his eyes the whole time...he's in a zone." Wow - that's quite remarkable how solid Flabba is playing acapella/bascapella, the guy must have an internal metronome like an atomic clock. Playing lines he probably hasn't played in 30 yrs & sounds like it could be the bass track soloed from the original recording. Intense! Alpha Boys School alumni I assume? People learned some serious technical skills there..
Edit: just noticed the bass lines are transcribed on those chord charts in the pics! Wow. Edited 1 time(s). Last edit at 10/20/2010 06:33AM by FLEXIMIX.